Ludec by Stephen Atkinson is due for release 29th July, here is a review by Terry Pattinson, award winning investigative journalist and Industrial Editor on the Daily Mirror in London for several decades. He is also a playwright who has seen much of his own work staged. Most of us wistfully wonder what might have happened if King Harold had been victorious at Hastings almost 1,000 years ago. Former Fleet Street reporter Steve Atkinson was intrigued – as was I – when he visited the ancient battle site several miles inland from Eastbourne. Atkinson, a lively and prolific story teller, has allowed his imagination to run wild to tell us what wonders could have followed if William, Duke of Normandy, had been slain at Hastings instead of Harold. 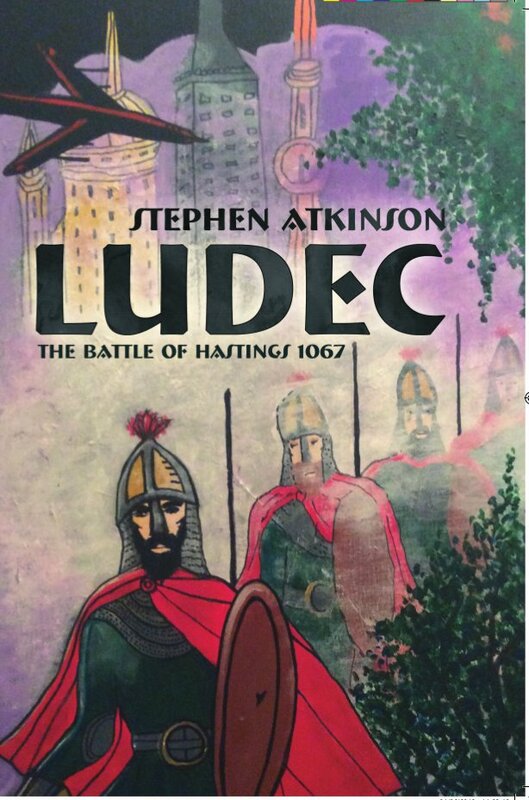 His fertile mind has conjured up an immensely readable tome called ‘Ludec’ about a 22-year-old only partly educated hero who valiantly cautions King Harold prior to the battle, one of the most important landmarks of British history. What – Atkinson asks – if Harold had been victorious on that fateful day? Most historians agree the English army, which had just famously defeated the Danes at Stamford Bridge, numbered around 7,500. But in Atkinson’s imagined scenario Harold waits and finally takes to the field with reinforcements totalling 15,000. Victory is assured over William, who can field only the strength he arrived with. But winning is never enough and that although Harold triumphed thanks to Ludec he was greedy for further conquest and finally meets a fate he well deserved. His lust for power led to his eventual demise. Ludec and his fellows speak largely in modern English – which is very entertaining when mixed up with the odd ‘sire’ and olde English names. In ‘Ludec’ Atkinson cleverly weaves his own intricately detailed mural to put even the BayeuxTapestry in the shade. Ludec is an amusing read, and it amazes me that nobody has ever thought of this before. Of all the war movies I have seen nobody has ever written a screenplay about the Battle of Hastings. My greatest regret is that Atkinson’s exciting fantasies did not in fact turn out to be real. Steve Atkinson’s story-telling takes on a life of its own and his unique style, including simplicity and humour, should be emulated by many authors who seem to specialise in boring their readers to death.